There’s nothing better than homemade ice cream—especially when you don’t have to put in the extra effort to churn it. Cheese in your ice cream might seem…well…a little unusual. 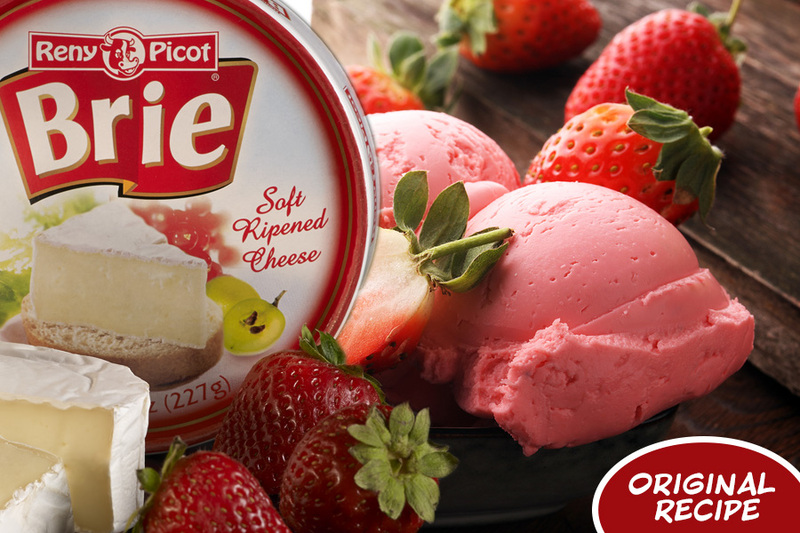 But the smooth texture and subtle flavor of Reny Picot Brie adds a new dimension to ice cream that is unbelievable satisfying. Swirling in fresh strawberries and rhubarb makes for the ultimate springtime dessert experience. Chill a 9×5 loaf pan in the freezer. Freeze Brie for 20 minutes. Remove from the freezer, cut off the rind, and chop into small pieces. In a large saucepan over medium heat, bring the heavy cream to simmer. Remove from heat and add the Brie, whisking until melted. Set aside and allow it to cool completely. Pour the cream through a mesh sieve to strain and place in the fridge to chill. Preheat oven to 350°F. Place strawberries and rhubarb on a parchment lined baking sheet. Roast for 15 minutes. Remove from oven and let cool. In a medium bowl, combine the sweetened condensed milk, vanilla, and a pinch of salt. Set aside. In the bowl of a stand mixer fitted with the whisk attachment, whip the chilled cream until stiff peaks form. Fold the whipped cream into the condensed milk and gently stir until combined. Pour mixture into the chilled 9×5 loaf pan and cover with plastic wrap. Freeze until thick and creamy (about 2 hours). Swirl in the strawberries and rhubarb. Cover with plastic wrap and freeze for another 2 hours, or until solid and scoopable.